What an interesting color challenge (CC307) at Splitcoast! I wasn’t sure I’d like these colors, but they’re growing on me. I wanted to use a purple c/s, but I don’t have eggplant, so I used the black and layered it w/ lavender. I used the eggplant, suede, red and a little green (for some reason I had it in my head that artichoke was one of the colors) for the colors in my butterflies. All images are Our Daily Bread designs. For my bg, I stamped the lg butterfly bg image w/ the white chalk ink and did what I think is close to the Black Magic tech. I actually learned this tech around 1999 or 2000 in a class I took from Helene Metievier (from Magenta Rubber Stamps). I don’t think it had a name then and Helene used pigment ink, but the chalk works just fine and it dries much faster. After I stamped the bg, I used the Prismacolor pencils to color over the solid white images. It may look like I made a lot of layers of this bg, but it was actually only one 5.25 x 4 pc. I cut it into 2 frames w/ lavender layers in between. On both of the layers, I made a faux layer by drawing a frame w/ a white marker. 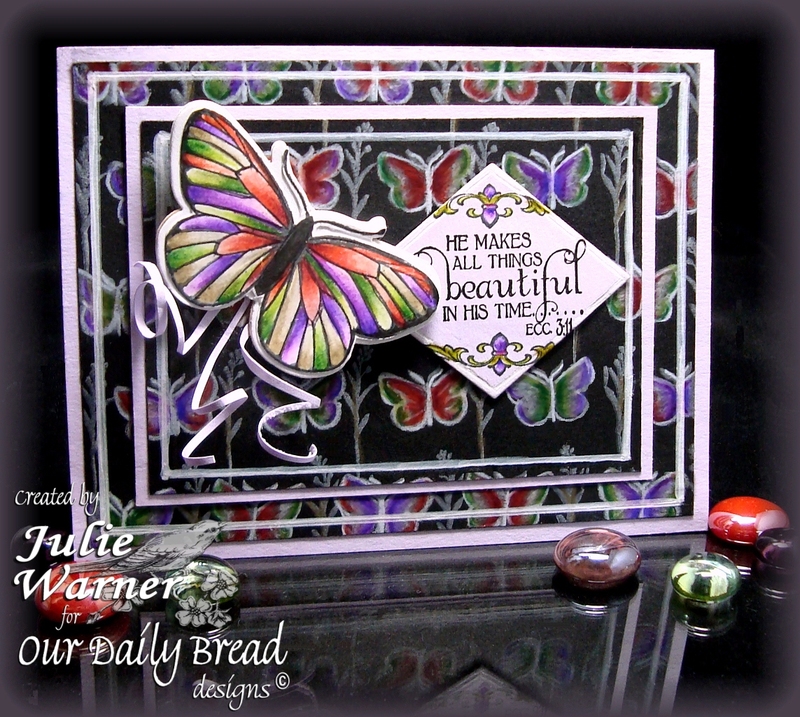 The large butterfly was stamped on white w/ black ink, colored w/ the Prismas and die cut using the matching ODBD butterfly die. 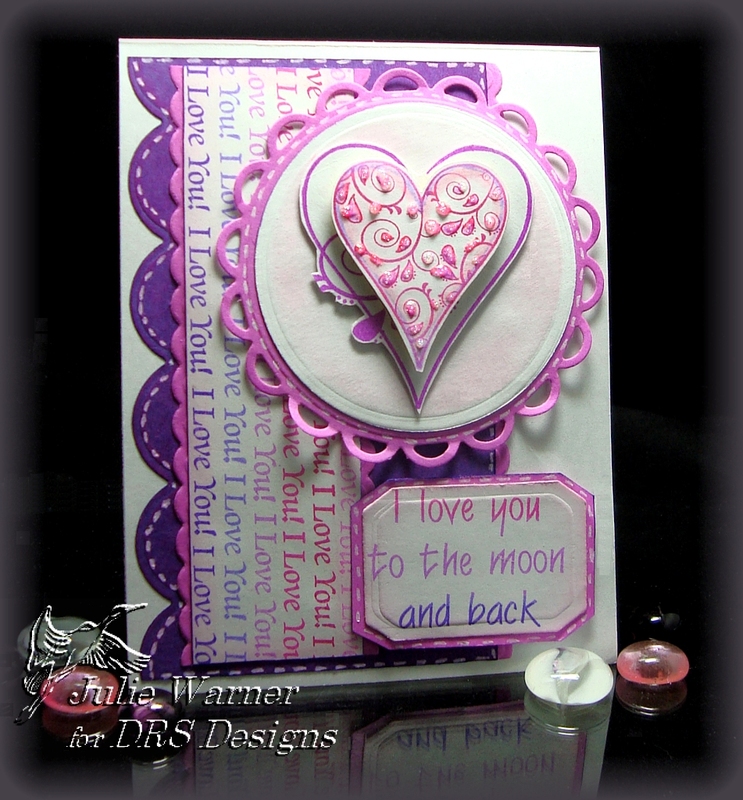 The sentiment was stamped on the lavender and die cut w/ a Spellbinders diamond shape. A few curled strips were added for the butterfly tail. More fun challenges at Splitcoast! This combines the F4A48, WT306 and CT0111. All images are DRS Designs. I used a Kpad to stamp the vertical band, and I used one color of the pad for each line, stamping the phrase over & over, etc. I used the smallest scallop border die for the magenta edges and the middle scallop die for the left purple edge. The hearts were stamped w/ different sections of the Kpad and layered on top of the circles. A tag die was used for the sentiment and I just cut one end, reversed the tag and cut the other end so they would both match. The finished card measures 4.25 x 5.5. Congrats to Tracy, today’s Featured Stamper at Splitcoast. I chose Vintage Flowers to case. I kept the layout, pearls & ribbon, but changed the colors, changed the flowers to butterflies and stamped my bg instead of using dp. All images are Our Daily Bread designs. 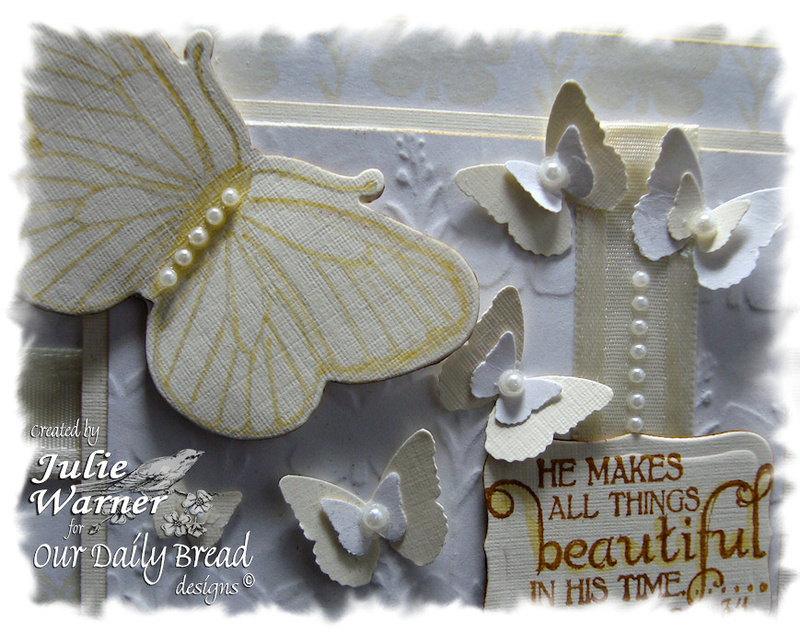 For the bg, I stamped the lg butterfly bg w/ soft vanilla ink. 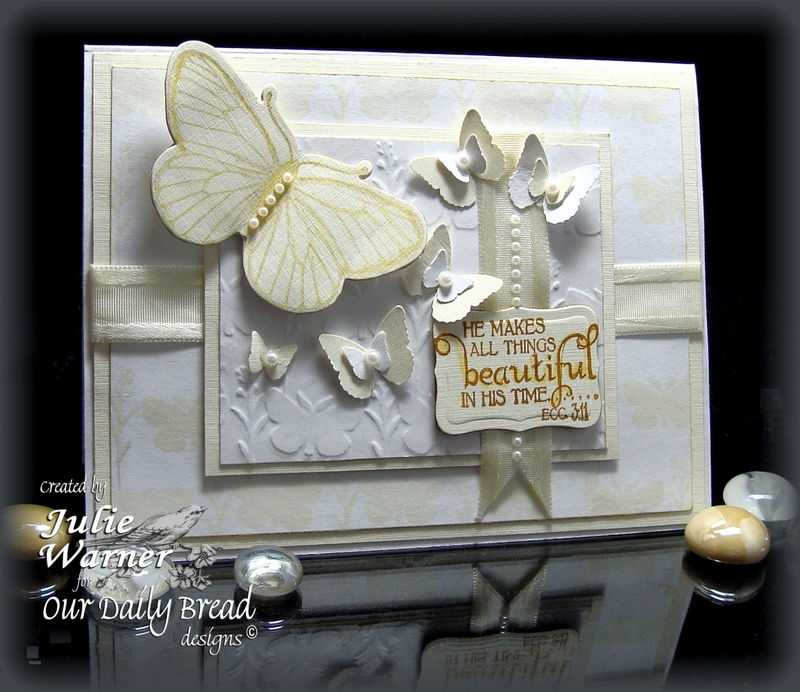 On the smaller white piece, I used the matching butterfly embossing plate. The lg butterfly was stamped and die cut using the matching die. The smaller butterflies were done with an MS butterfly multi punch. For the sentiment, I used the gold ochre marker to ink the stamp and die cut it using the Spellbinders Labels 8. All layers have an ivory linen backing. I added some ribbon and small pearls to finish the 5.5 x 4.25 card.